Due to be held at the Sonesta Maho Beach Resort And Casino from November 1 to 15, this year’s edition of the WSOPC Caribbean will feature numerous side competitions as well as a main event offering a guaranteed prize pool of at least $250,000. Eschewing the normal $1,675 buy-in, Intertops Poker and Juicy Stakes players are being offered the chance to win a seat into this lucrative game for as little as $3.30 simply for winning a three-stage satellite online poker tournament series. The Horizon Poker Network sites stated that the ultimate champion will bag a prize package worth $3,375 that is to encompass their WSOPC Caribbean main event buy-in along with a five-night all-inclusive stay for two at the Sonesta Maho Beach Resort And Casino. The winner will additionally pocket $600 for travel expenses alongside a cash game buy-in token worth $100. 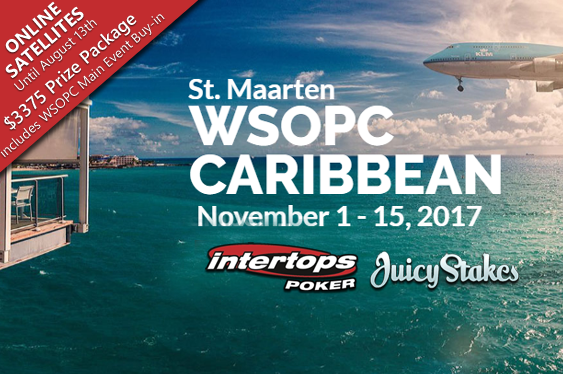 Intertops Poker and Juicy Stakes are to run a three-stage satellite online poker tournament series that will award a prize package into the main event of November’s WSOPC Caribbean.